A pervasive message about variable annuities (VAs) is that they are overpriced and therefore inefficient retirement planning tools. 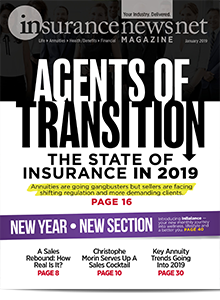 The unfortunate aspect is that this pejorative commentary on VAs has been based on outdated perceptions of variable annuity products and client needs. The makeover of annuities since 2009, particularly VAs, is changing the value proposition for advisors and clients. This evolution deserves to be more widely understood and discussed. The 1990s were the decade of investment-option proliferation, combined with emphasis on upside potential, tax deferral and death benefits. The 2000s will be remembered as a race to market increasingly complex VAs, chock-full of intricate guaranteed living and death benefit options combined with asset allocation investment overlays. The present period from 2009 forward, in contrast, is characterized by more targeted product structures and greater product diversity. 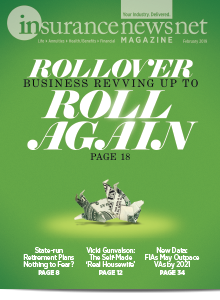 By altering both the basic product and the bolt-on benefits, the VA industry is crafting more consumer-friendly offerings, products focused on specific solutions to better meet clients’ retirement needs. 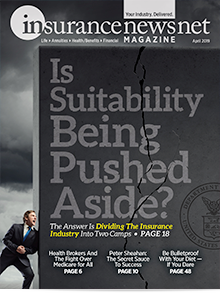 Providers are decoupling the basic VA accumulation “engine” from the guaranteed benefits, a trend that has given birth to cost-efficient variable annuities and so-called investment-oriented variable annuities (IOVAs). The predominant feature of cost-efficient VAs is an extensive range of investment choices, including alternatives. Subaccount management charges, mortality and expense fees, and commissions are lower. Most also include account value-only death benefits. 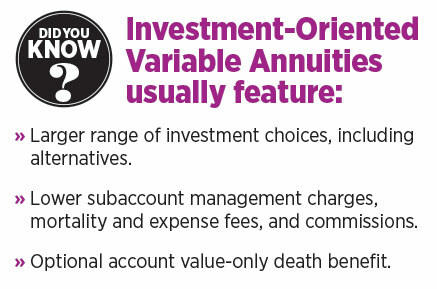 IOVAs are the most stripped-down or basic variable annuity product. They emphasize investment flexibility, lack living benefit riders but guarantee an income stream, and include enhanced death benefits only as optional riders. Depending on the individual product and share class, they may have no surrender period, pay no compensation or both. The more accumulation-oriented IOVAs emphasize investment choices for asset growth. The more traditional variable annuities with living benefit riders limit investment choices to less volatile asset classes and investment strategies, reducing downside risk in exchange for higher targeted payouts. Ten companies offer IOVA products, up from four companies just a few years ago. 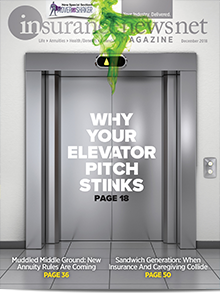 Sales in 2013 were $7 billion and as of November stood at $4.2 billion. The number of investment options in these products varies from 80 to 380, according to Morningstar. Among traditional VAs (those with living benefits fully incorporated in the product), there is a growing trend toward developing income-oriented products but with more restrictions on investment options. Providers also are introducing innovations like volatility control and risk-balanced funds, which aim to limit the downside risk to contract values. That, in turn, reduces the cost and risk of hedging the guarantees, making these products more sustainable than their predecessors. This transformation of the VA industry poses distinct advantages for advisors and clients. Because individual product types are more focused, they can be understood more easily by consumers. The importance of this cannot be overstated. According to recently released information from KPMG, numerous surveys have shown that consumers resist VA purchases because they are mystified by what they see as complicated products. Provided the industry invests in quality education programs, the advent of more easily understandable products will remove a major barrier to investment in VAs. 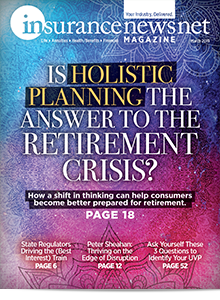 Mentally and practically, clients will gain another retirement planning tool, one with fewer restrictions than qualified plans have. The more targeted nature of many contemporary products means that advisors should have greater control of the overall combination of investments, optional benefits and guarantees added to clients’ portfolios. 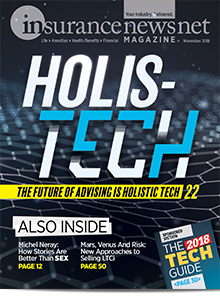 Because advisors can choose among traditional, cost-efficient and investment-oriented VAs, they are better able to help clients obtain and pay for only the features they need most, based on individual client circumstances. A traditional VA may be the best fit for a client with a retirement income gap. Tax deferral, breadth of investment options and tax-free transfers may make an IOVA a suitable choice for a higher-net-worth client feeling the pinch of higher income tax rates since 2013. The value of tax-related benefits through tax deferral in today’s environment should not be underestimated. For those earning more than $250,000 annually, the combination of new Medicare-related taxes on earned and unearned income and higher income and capital gain tax rates can have a substantial impact on their effective tax rate. Most retirement income portfolio models emphasize overall outcome (such as level of income or years of income) over investment return. These models aim to achieve the outcome through a mix of product categories, each of which plays a designated role. Product simplification and more specific product objectives will make it easier to incorporate variable annuities into such models. For example, a cost-efficient VA might be added to a model primarily as a cost-effective means of providing continued tax-deferred growth potential after age 70½, when minimum distributions from qualified plans become mandatory. Because the cost-efficient alternative has fewer “moving parts” than a traditional VA, fewer assumptions and “what-if” scenarios are required to project the range of its potential impact on overall portfolio results. Al Dal Porto is vice president of product development and market research with Security Benefit. Al may be reached at [email protected] .